The sweetness of both radish and carrot makes the meat taste even better. If you like packing lunch for work or school, this dish is a great choice. Radish is in season here. Price is crazily good, under 1 dollar per kilogram. They are beautiful, sweet and juicy, not like those taste bitter and with woody hearts. In Chinese cooking, we often like to balance radish with carrot as radish brings cooling effect on our body in Chinese medicine's perspective. I like the white and red colour combination too. The sweetness of both radish and carrot makes the meat taste even better. If you like packing lunch for work or school, this dish is a great choice. Rinse and wipe dry the chicken thighs. Roughly chopped and mix with the marinade. Set aside for about 30 minutes. Heat oil in a wok or large heavy-based pot over medium-high heat. Sauté ginger, garlic and shiitake mushrooms. Toss in the radish and carrot. Stir fry for 5 minutes. Push the vegetables aside. Add some oil in the middle. Add chicken and cook until all sides are brown, about 4 minutes. Pour in water. Cover and cook until the chicken is softened, sauce is reduced by two-thirds. Season with salt if needed. Add thickening and cook to your preferred consistency. Stir in spring onion. Done. Serve hot. If your wok is not large enough, you may brown the chicken in batches. Choose the radishes with a firm and heavy feel. That means it contains more water. The skin should be smooth and thin. It tells you that they are not old. 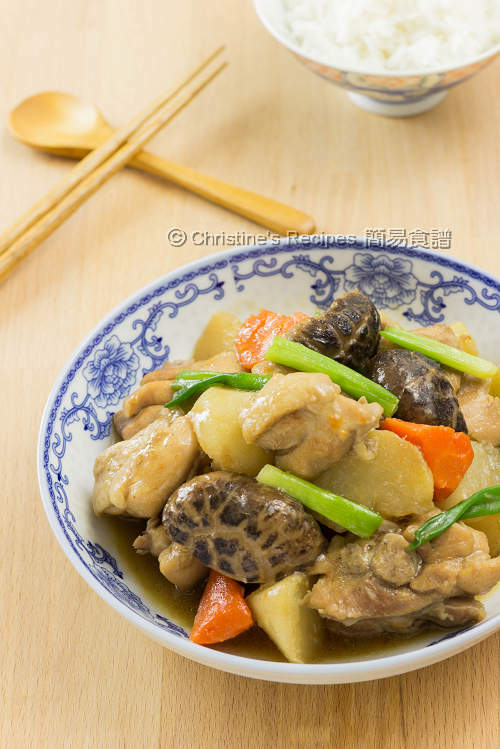 In Chinese herbal medicine, ginger can expel cold wind in body and balance with the cold effect of radish. 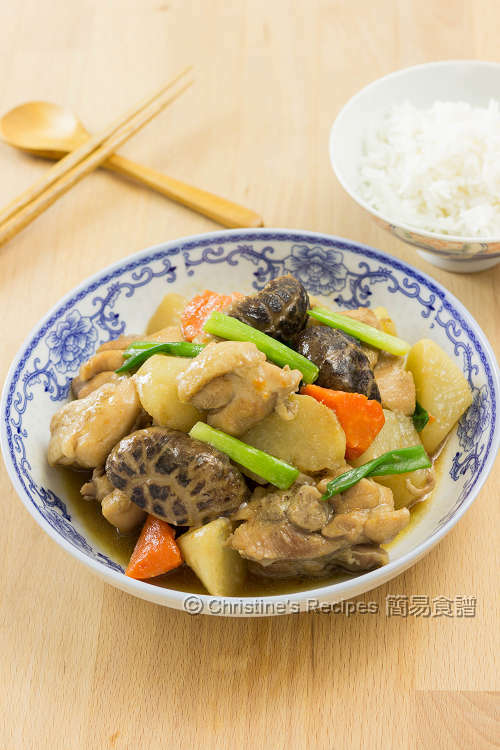 In Chinese cooking, we like meat braised with bone in. It will make the whole dish more delicious. But if you have young kids, you may use chicken thigh with bone off instead. 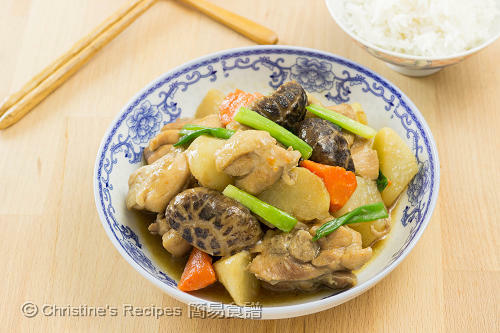 My mom did a similar one with pork, and I was always the one who picked all the radishes and mushrooms :-)) They are so delicious after absorbing all the gravy. Same here. I ate most of the radishes and mushrooms. :) They were so delicious. Christine, do you cook on medium or low flame after adding the water and about how long? I used about 35 mins to make this dish on medium heat, sometimes on medium-high. But the cooking time depends on the power of your stove and the material of your pot. All you have to do is to get the chicken and radish cooked and softened, the sauce reduced and thickened. Glad that you liked this recipe. I love onions too. Christine you say to chop the chicken thighs, but how do we do this with the bone in? Thank you for your time. I love your recipes! Oh, I followed my mother's way of cooking this dish with chopped chicken thighs. I've got a cleaver knife for chopping. Without any hesitation but with confidence, chop in one go for cutting up a thigh sharply. If a cleaver knife is not close at hand, you can skip the step. 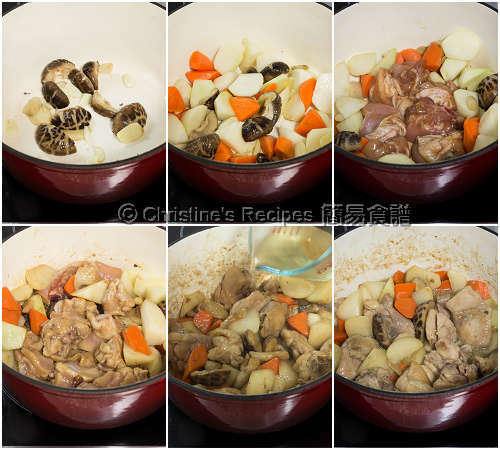 Simply cook the chicken thighs in whole pieces. No problem at all. That makes sense. Thank you Christine. I guess a sharp cleaver will be my next purchase as I explore your wonderful Asian cuisine. If you have Asian butchers around your area, they might help you to chop the thighs for you. Can I use whole chicken instead? Sure, you can use whole chicken if you like.